Police in Indonesia say they have captured the head of Jemaah Islamiah (JI), the Islamic militant group blamed for the 2002 Bali bombings. 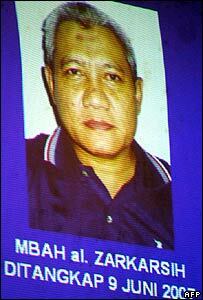 The man has been named by police as Zarkasih, also known as Mbah. Police said he was captured last weekend, on the same day that Abu Dujana, leader of JI's military wing, was arrested. As well as the Bali bombings, JI is accused of carrying out a string of attacks throughout South East Asia. Observers say the arrests strike a double blow for the shadowy organisation, although its membership and recruitment networks could still remain largely intact. Police said Zarkasih, alias Mbah - which means grandfather in Javanese - was arrested last Saturday in the city of Yogyakarta on Java island. He was detained a few hours after 37-year-old Abu Dujana was captured along with several others, also in Java. Abu Dujana's arrest was confirmed by police on Wednesday. Video-taped confessions of the two men were shown at a police news conference. "I became the emergency head... in 2005," said Zarkasih, whose name was corrected by police from an earlier spelling of Zarkarsih. Abu Dujana was taped saying: "From 2005 until now I was head of the military wing (of JI)." Surya Dharma, of the country's anti-terror unit, said Zarkasih "controlled JI operations across the whole of Indonesia", and was in charge of training, weapons and managing attack missions. He said both men would be charged with violating anti-terror laws. JI is believed to be seeking a pan-Islamic state in South East Asia. Zarkasih, 45, is believed to come from central Java, and had worked as a teacher before going to Afghanistan, like Abu Dujana, in the late 1980s. While in Afghanistan, both men are believed to have been exposed to radical ideas and may have developed links with al-Qaeda. Zarkasih is thought to have come to prominence within JI in recent years, as the organisation went through a period of change following a crackdown on its activities. Scores of arrests, and an internal debate about its methods, led to splits within JI and splinter groups forming. 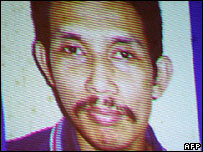 One of Indonesia's most wanted men, Malaysian Noordin Top, is thought to lead a splinter group. Police accuse him of having a hand in most of the bomb attacks since 2002. Vice-President Jusuf Kalla said on Friday that the arrest of Noordin was now "just a matter of time". However, Surya Dharma said that despite their differences, Zarkasih and Abu Dujana "will not betray him by revealing his whereabouts". What next for Jemaah Islamiah?